Assalamualaikum. May Peace be with you on this wonderful Daily Photo Theme Day. Kuala Lumpur has 7 sister cities. One of them is the place of martyrdom, Mashhad, Iran. **Mashhad is the second-largest city in Iran and one of the holiest cities in the Shi'a world. It sits about 900km east of Tehran and has long been the center of secular as well as religious learning. The large Ferdowsi University of Mashhad, named after the great Iranian poet, is located here. Ferdowsi (935-1020) is a highly revered Persian poet. He was the author of the Shāhnāmeh, the national epic of Persian-speaking world as well as the entire Iranian realm. The Shāhnāmeh, or the "Book of Kings," consists of the translation of an even older Pahlavi (Middle Persian) work. It has remained exceptionally popular among Persians for over a thousand years. It tells the history of old Persia before the Arab conquest of the region. This tale, all written in poetic form and in Darī Persian, starts 7,000 years ago, narrating the story of Persian kings, Persian knights, Persian system of laws, Persian Religion, Persian victories and Persian tragedies. Ferdowsi is one of the undisputed giants of Persian literature. After Ferdowsi's Shāhnāmeh a number of other works similar in nature surfaced over the centuries within the cultural sphere of the Persian language. Without exception, all such works were based in style and method on Ferdowsi's Shāhnāmeh, but none of them could quite achieve the same degree of fame and popularity as Ferdowsi's masterpiece. Ferdowsi has a unique place in Persian history because of the strides he made in reviving and regenerating the Persian language and cultural traditions. His works are cited as a crucial component in the persistence of the Persian language, as those works allowed much of the tongue to remain codified and intact. In this respect, Ferdowsi surpasses Nezami, Khayyam, Asadi Tusi, and other seminal Persian literary figures in his impact on Persian culture and language. Many modern Iranians see him as the father of the modern Persian language. The picture above: the Tomb of Ferdowsi. 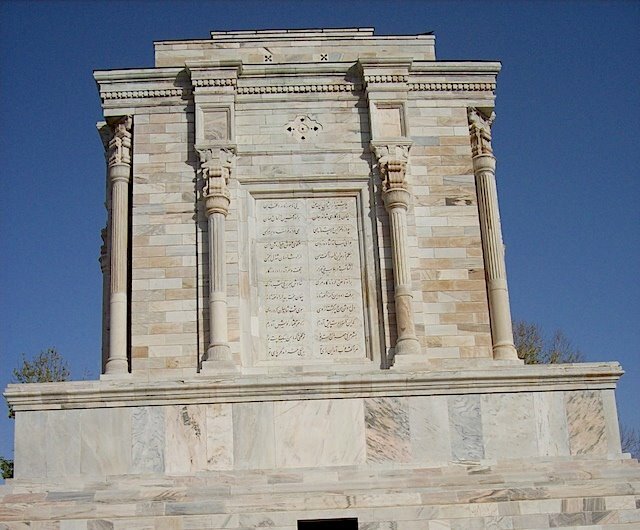 Ferdowsi was buried at the yard of his own home, where his mausoleum now lies. It was not until Reza Shah Pahlavi's rule, in 1925, that a mausoleum was built for the great poet. Click here to view thumbnails for all 148 participants. That's a lot of sister cities participating in this month's theme. Let's travel the World. * Meead, thank you so much for this picture. I wish you peace. I'm very happy we made this swap. Edwin, how lucky you are that Meead lives in your sister city! Nicely done. Edwin & Meead, well done. Very interesting post. You two do have good sister cities. Very interesting. Wonderful photo! Thank you for stopping by my site. Thank you so much Edwin. I'm proud of our sister city, Kuala Lampur. It is really a diamond. Lots of Iranians study and live in KL. Thank you again. Thank a lot Edwin.I agree with Meead. I had a trip to KL 4 years ago.That's a very nice city.very nice! That was very interesting! And the sister-city relationship is strengthened by your collaborating to get this post done!! Both of the photos are great. Thank you for the informative text. That's a really cool picture and swap - Bonds of Friendship, indeed! Yes, Sally is correct...bonds of friendship really works. Good info., too! beautiful photograph from Meead and lovely to see yours on his blog, Edwin. This Theme has been wonderful for those who have a sister city blogger. Fascinating regardless tho. Thanks so much for the commentary on yours which is SO interesting. great collaboration! thanks for stopping by my blog! A beautiful post, Edwin. Thank you for sharing with Meead. I watched the movie Kite Runner last night and one of my favorite scenes was where the young Afghan boys were watching a cowboy movie dubbed in Farsi. The boys were sure Paul Newman was from Iran. Denton from Greenville and the Daily Photo Map. hello edwin.are you traval to iran? beautiful sister city!! very interesting info!! Thanks! wow ... am Iranian & I didn't know that. Thanks for the input. Thanks for the post ... Really where is it said that Mashhad is the sister of KL? By the way , I live in KL now , anytime planning to go to Iran , u can contact me for any help!